The 2-engine Manchester bomber is used for the first time during an RAF raid against Brest. Reconnaissance elements of the German 5th Light Division clash with British forces for the first time in Africa, at Nofilia near El Agheila. US Navy survey ship Bear and motor ship North Star arrive in Antarctica to evacuate remaining US personnel from Byrd’s 1939-40 expedition. Parliament begins a two day debate on the conduct of the war. USS Enterprise attacks the Japanese garrison on Wake Island. ‘Big Week’ continues with a co-ordinated RAF and USAAF attacks on the Schweinfurt ball-bearing factory. A haggard and aged-looking Hitler addresses his Gauleiters and Reichsleiters for what proves to be the last time in the Reich Chancellery in Berlin on the occasion of the 25th anniversary of the proclamation of the Nazi Party program. Perhaps sensitive to the likelihood of public scepticism and derision, he refuses to allow the speech to be broadcast or even reported to the public at large. A German counter attack wipes out the Russian Hron bridgehead over the Danube to the northwest of Budapest. German U-boats sink 8 ships and 2 destroyers from a convoy bound for the Russian port of Murmansk. 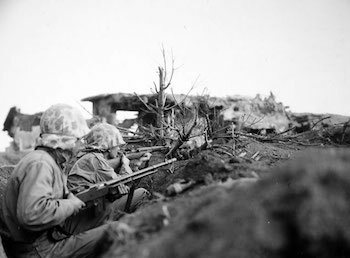 U.S. Marines capture a second airfield on Iwo Jima. Egyptian Prime Minister Ahmed Maher Pasha declares war on the Axis and is immediately assassinated in the parliament chamber.